Pack, ship and more at over 1,800 locations. Stop in for convenient access to FedEx Express® and FedEx Ground® shipping services, supplies, boxes and packing help. 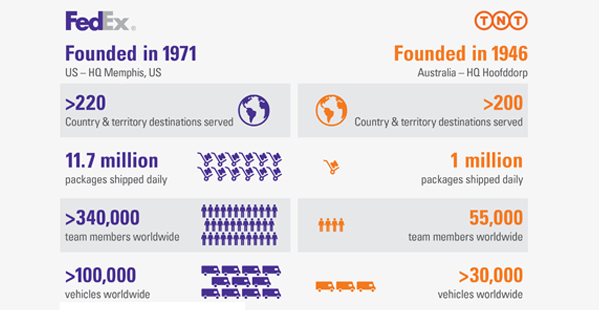 TNT Express is the largest acquisition in FedEx history, and its benefits are expected to be equally significant. The addition will transform our global portfolio of solutions, particularly in Europe, substantially lower our cost to serve our European markets by increasing density in our pickup and delivery operations and accelerate our global growth. To help us realize the value of the transaction, we’re applying our ACQUIRE process that we’ve refined over many acquisitions. It’s a cross-functional management system used to complete a transaction, integrate a new company and help us obtain the financial results we intend. Today more than 20 FedEx and TNT Express functional and geographical teams are working together to ensure a smooth integration and long-term strategic success. Rankings based on CY2015 company-reported data. FedEx and UPS estimates reported as shipper-based. DHL and TNT reported as payor-based. For U.S. air export, shipper-based estimates were used. Regional estimates are made based on FedEx region definitions. Source: FedEx Market Development. Combining TNT Express with our intra-European and intercontinental Express services will make our operations more productive and efficient. TNT Express broadens our portfolio, delivering long-term shareowner value.